Peggy's 8th grade school photo. 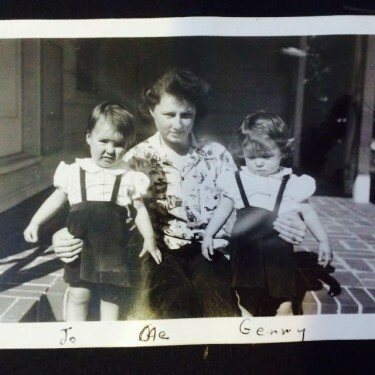 Peggy with her twin baby cousins. Margaret Jane Littmann Baccelli is known as Peggy to her family and friends, and she lives just across town from me. On the day I first met Peggy, she showed me a painting her father had made of the Japanese attack on Pearl Harbor as seen from their front yard. That painting was often in my mind as I wrote the battle scenes in my book War on a Sunday Morning (you can see it below). 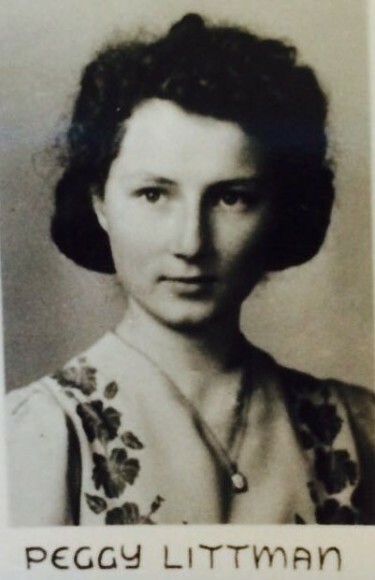 Peggy was 13 years old and in the eighth grade when her family moved to Pearl Harbor, Hawaii. Peggy’s dad was a communications officer on the USS Oglala and her mother was a capable navy mother, managing all the family moves. Peggy had three older brothers, including Don and Bob who served in the navy during the war. Bob was shot down and killed in action. When Peggy and her father, mother, and brother, Vince, arrived at Pearl Harbor, they were awaiting housing of their own, so they lived with her aunt and uncle and their son and twin baby girls. Her uncle was also in the navy. Peggy was a shy girl, and wasn't on the island long enough to make good friends, but she remembers enjoying watching the boxing matches at Bloch Arena with her brother. She and Vince also collected matchboxes with ships on the covers. Peggy really did watch the attack on Pearl Harbor from her front yard, and it happened much as I describe it in the book. Her dad ran to assist at the base during the attack and later tried to help at the hospital. And Peggy and her mother, aunt, brother, and cousins were evacuated to the YMCA in town, where Peggy’s father later found them. Many of the little details in the book come from Peggy’s memories, including her brother making small dishes (which I referred to as ashtrays) out of coconut shells and how Peggy had to craft her own Christmas tree. But I also wanted to explore the treatment of the Japanese and Japanese-Americans in the days immediately after Pearl Harbor, so I added in that story line. You can read more about Japanese internment during the war in my book, The No-No Boys. 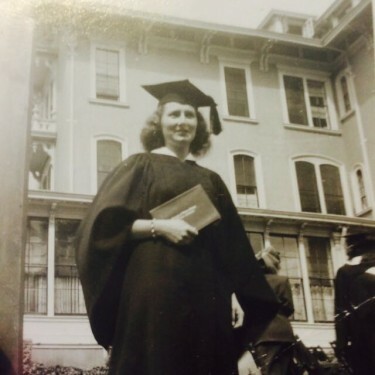 When she grew up, Peggy worked for as a clerk for the Southern Pacific Railroad and then married Albert Baccelli. They had three daughters. She later worked as a pre-school teacher, and Peggy is an artist herself! 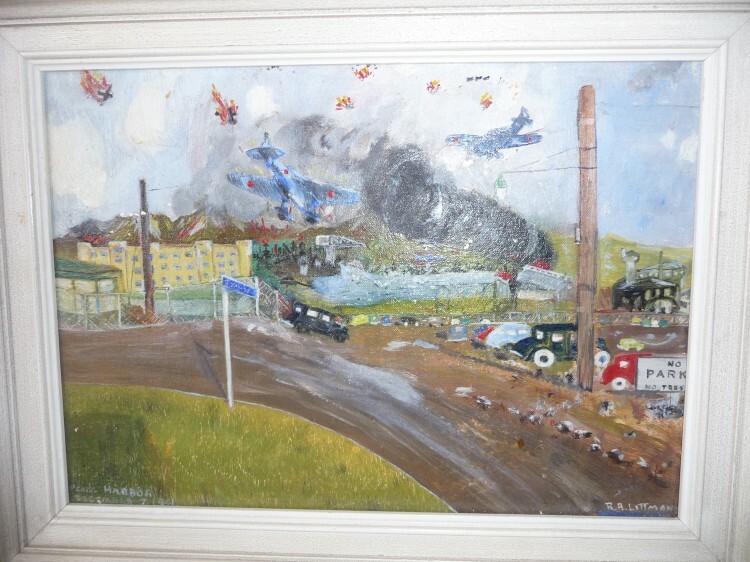 Peggy's father's painting of the attack on Pearl Harbor as seen from their front lawn.